Region 2 Winner: The FUNdation, South Elgin, Ill.
On Oct. 21, 2011, we marked the beginning of an incredible journey for FUNdation and the Village of South Elgin, Ill. We marked our celebration as the region 2 winner of the Together We Play™ contest by hosting a kickoff celebration at the location of our inclusive playground site. We held a community options planning session and invited many local community members to help us dream big! Great design ideas were shared by school administration, parents, Village administration, parks and recreation staff, teachers and committee members. In December, we received conceptual designs from Shane’s Inspiration and are on our way to completion. Several of our committee members visited Landscape Structures in Delano, Minn., to take a tour of their production facility. Not only are the products produced by Landscape Structures of the highest quality, we learned so much about the culture of their business. And with the addition of their concrete manufacturing plant, nothing is impossible to create into play. We plan to include concrete products in our playground design. Tiffany Harris and Brad Thornton from Shane’s Inspiration joined us on a cold, blizzard-filled evening in January as we reached out to our community members to gain support for this inclusive play project. After we shared our vision for inclusive play with those in attendance, we asked everyone to become ambassadors for this unique project. We have hosted two more open houses to educate community members, and we continue to research possible funding opportunities to help us meet our $1.1 million budget goal. 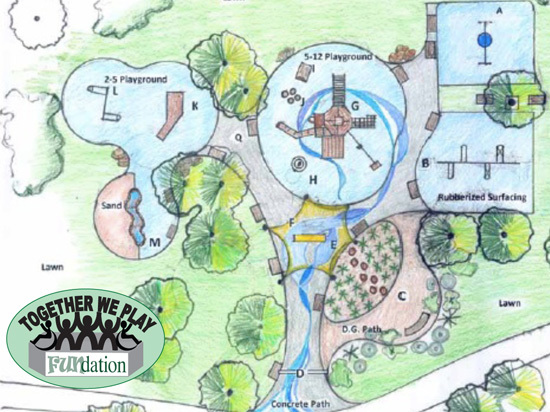 This entry was posted in Community, Inclusive Play, Inclusive playgrounds, Together We Play contest and tagged community, inclusive play, Landscape Structures, Shane's Inspiration, Together We Play by PlayLSI. Bookmark the permalink.